My Mom taught me this one after she came across an article that said that electricity is still being consumed by appliances that remain plugged into the socket, even though you aren’t using it and its switched off. It was described as a “vampire appliance”. The kitchen might be your first place to look. Is your toaster or oven or microwave plugged in all the time? How often do you use them? Removing the plug after use might help you save quite a bit. It helped us – we were testing with various equipment in the house and the one that helped the electricity bill drop the most was the electric oven. I have practiced this one for a long time. If you leave a room or area in the house and don’t intend to return within 10 minutes, switch off the lights. This includes the kitchen, bathroom, living room, storeroom etc. My kitchen is near my living room, so if I need something from the kitchen, I don’t switch on the lights unless I am looking for something specific. The ambient light from the living room is usually sufficient for me to see what I want – usually a glass of water or a fruit from the fridge… which has its own light anyway. In the day, where possible, I use natural light. Hands up how many of you leave your computers, laptops and TVs plugged in and on standby mode when not in use? Don’t. Standby mode draws on electricity too. See point 1 above. If you aren’t going to be using them, switch them off and then unplug it. It might take a little longer for your computer to boot up, but really, unless its a life and death matter, why the rush? 😛 In my household, most switches are kept off for most electrical appliances (and unplugged). Doesn’t take 2 seconds to switch it on whenever I want to use it. An oldie but a goodie. Where possible, use energy saving bulbs in your lights. These days, even fluorescent tubes come in an eco-friendly energy saving option and because so many people are buying them, energy saving bulbs are also now more affordable than they were before. Even if they are more expensive than regular lightbulbs, they have a longer lifespan and can ultimately help you save money. Thanks for the tip Andrea! I didn’t think about it that way. I didn’t know about no 1. The reason is that we have switches for the plugs. So I usually just turn the switch off. Yup so did I but apparently its not enough. 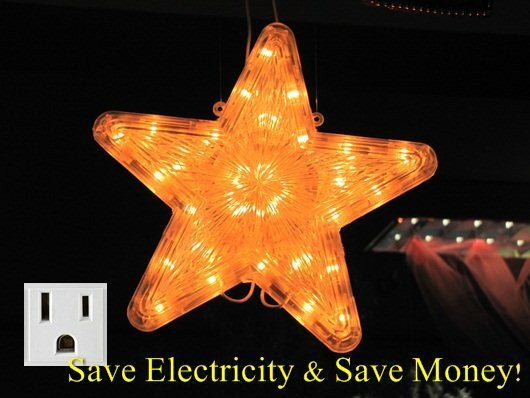 I use energy saving lights, its more expensive but it helps save electricity and the environment at the same time! I use energy saving lights where possible too and its usually a one time cost because those bulbs can and do last a long long time! Good call on the extension cords too. switched to an inverter refrigerator awhile back. boy! did that purchase help my household electricity bill! Thanks Violet 🙂 I also didn’t realize that about the plugs because I always thought that once its off, that’s it but apparently, it does make a difference if you unplug and when you don’t. We also have switches for the plugs in our home. Helps keep the sockets from becoming loose with constant unplugging and re-plugging. And you just got a new HUGE tv! 😛 As for air-cond, I have to agree with you. I can’t sleep without the aircond but I keep it at a high-ish temperature – enough that I don’t melt but not so cold I have to wear a winter coat LOL! thanks for these great tips PB! Get reading lamps 🙂 I can’t install solar panels as I live in an apartment so I just have to do what I can 🙂 Great to know the sun is helping you though! Install lights with dimmers – allows for lower lights and a bigger range of brightness, so it’ll be more flexible usage. Maximise lighting by installing mirrors, painting walls a lighter colour, and reducing clutter on wall space. Ornaments, bookshelves, tapestries all serve to diffuse light and one will need more lighting to light up a room that way. Install the air-con far away from windows, and if you cool air mostly, only install it on the ceiling. Cold hair sinks so this makes sense. If it’s near the window, cold air is of a higher pressure so it will constantly shift towards freshly warmed air from sunlight shining in or from heat entering from window gaps. Pull the blinds when air-conditioning, or get double glazed glass (better insulating). Be mobile – take the laptop with you into the kitchen if one light is enough for your uses there. A ceiling fan consumes more electricity than a standing floor fan. The largest consumer of electricity in a household is generally the water heater, refrigerator, oven, washing machine, air-conditioner/radiator/space heater and lights. The best way to conserve usage is by living in a space well-designed to insulate heat and save lights. Alternatively, use less hot water, use a freezer instead of a refrigerator (buy fresh! ), wash below 40 deg C etc.